I like the green colors you add in for the scan and it done wonderfully but you did realised that she has not been extracted out neatly. She doesn't blend well with the background. Some of the blurriness does not works well in some part. The BG is great with the wings and the birds and the colors. I think that the character is from Rozen Maiden, I forgot her name.Love the emerald backround, I see this wall kinda misterious and dark.But a great wall non the less. Thnx for sharing! Keep up the good job! Nice Goth one. My congratulations to you. though seems to differ form the image of the character, looks nice. oh WOW! O.o i absolutely love this! 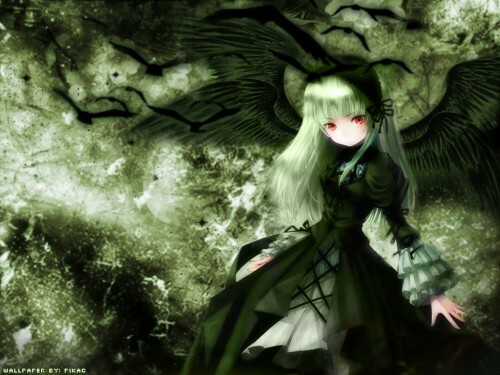 emerald is rare to see with a dark Rozen Maiden theme! it's sooo beautiful! the bg is blurry though. omg... this has been the best work that i've seen from you so far. good job! the green colors are really nice. Her eyes stand out alot. The birds look really good too. The only thing is that the bg is a bit blurry looking. yes, and BlueAngel is right - i think this is the best wallie youve done! It's just a bit blurry & the stars overtop look too sharp. >_< The birds are awesome but again too blurry. Nice, I love the green and the birds. wow nice bg. i like it. the black with green and others are great. Such an awesome wall you created! The BG is really nice; though felt a bit flat. Though so, her face isn't in high detail -- that's too bad that her nose and mouth is out of nowhere... :(. However this is a good wall; keep up the good work!